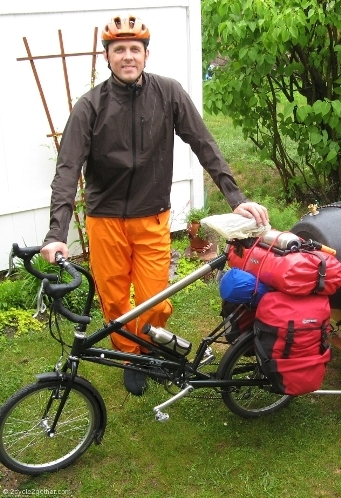 For our trip, I ended up choosing a jacket manufactured in Canada from locally produced eVent material and sold under the “Cutter” brand and a pair of waterproof breathable pants made in the USA for Rivendell Bicycle Works utilizing Japanese fabric. I went with the Cutter Cyclical jacket (**see update below**) after reading an article that mentions a study undertaken on behalf of the US military which concludes that eVent breaths better then any other waterproof/breathable material currently used in the production of consumer rainwear. 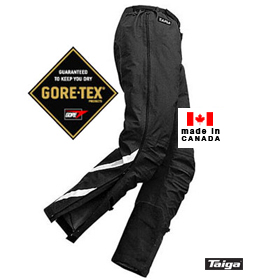 I also like eVent it because it is produced in North America (Gore Tex is produced in Asia) and it sews up into an incredibly light garment. My Cutter jacket replaces a worn-out but well-loved bright yellow Burley Cooperative rain jacket made from Ultrex and coated nylon that served me well for fifteen years. Amazingly, the Cutter jacket is approximately half the weight of the Burley yet offers the same, if not better protection. I can already say from personal use, that the Cutter jacket suffers nowhere near the clammy feeling I’ve experienced in other waterproof/breathable gear. Vapor transmission is remarkable. In fact, I find I wear this jacket as much when it’s not raining as when it is, a powerful statement for a rain jacket. The heritage of this jacket is interesting. After digging a little, I discovered that it was produced by the Canadian eVent manufacturer Westcomb for Backcountry.com, which markets it under their “Cutter” brand. In a telephone conversation I had with a Westcomb representative, I urged Westcomb to produce their own line of cycling rainwear to compete with the sweatshop produced Showers Pass line, which also markets eVent rainwear, although none of it anywhere near the same quality or ethical footprint. After narrowing my choices down to two pants, I was happy to come across these pants made for the innovative Rivendell Bicycle Works. I use the term “innovative” since, contrary to most every other bicycle shop out there, they do their damndest to steer clear of sweatshop produced gear, and choose instead to support high quality, ethically-produced alternatives. One of my main issues when purchasing pants of any sort is the measurement of the inseam. My legs are long (I’m 6’2” tall) and unless a manufacturer offers a “Tall” option or I can specify the inseam length, many times my pants arrive as ‘knickers’. So, I was glad to hear from Rivendell staff that they included a long inseam, and I can concur from use that they fit me well. Lots of venting options, a comfy fit, and a great “don’t hit me” color wind up the pro’s of these pants. I wanted to add some color to my rainwear (the Cutter jacket is deep muted brown) and these pants definitely do the trick. For another domestically produced eVent cycling jacket check out the Hincapie Signature shell. George doesn’t sew his own clothes, so I wonder who’s ghost-producing this jacket…? My two runner’s up for pants were Taiga’s Cyclotron Pants for which I could have paid an extra fee to have made long enough (putting the price over US$200) or the “Tall” version of Mocean’s Summit Pants which (check out the color choices!) would have complimented nicely my other Mocean clothing. However, in the end, I wanted to send some of my dollars to the good folks at Rivendell and, in doing so, support their sourcing goals, which mirror mine so well. Another domestic source which I would have gone with, but the arms of their jackets and inseams of their pants were not long enough, is J&G Cyclewear. Their very reasonably priced cycling specific rain wear, and other clothing, can be found here. Another option still being produced in the UK is Lusso. Their pricing is also very reasonable and all of their gear can be viewed here, just click the product link “Jackets – Waterproof” to see their rain wear. And while not specifically designed for cycling, there are three more domestic sources of eVent jackets and pants (plus other bomb-proof gear) all offering super-high quality and all guaranteed for life. They are British Columbia’s Westcomb, New Hampshire’s Wild Things, and Calgary’s Integral Designs. Keep an eye on this last one; they were purchased over the late winter by the group that owns RAB and since more and more of RAB’s gear is made in sweatshops I’d expect the same to happen over time to Integral Designs, even excepting the assurances given on their site. So that’s the skinny on my rainwear. If you decide to purchase something listed above, and have to order online versus purchasing from a locally owned store, please consider purchasing through our online affiliate store. Your final cost isn’t affected but your purchase helps us earn a small commission. 01/03/2013 – A great alternative to the discontinued Cutter rain jacket described above can be had by checking out the “S1-J Riding Jacket” manufactured in Brooklyn, NYC, for “Search and State“. It looks to be another great jacket utilizing Schoeller’s innovative c_Change fabric. 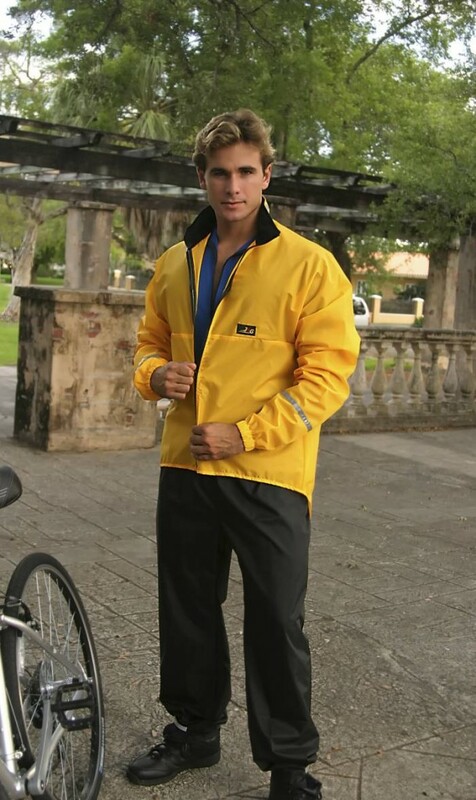 It looks like this (Cutter Cyclical jacket ) may not be available (May 2011). I can find a couple of smalls, that’s about it. Any thoughts? Yup, unfortunately the Cutter jacket was only manufactured last season. And, judging from the hammering that backcountry.com took over the winter by selling 800+ jackets at 50% off MSRP, I don’t expect this jacket to ever surface again. My guess is that the ‘Cutter” brand just didn’t (doesn’t) have the kind of traction (name recognition, large and loyal following, etc.) necessary to pull off a US$300 cycling jacket. Now, had Westcomb stuck their name on it instead, I expect the outcome would have been somewhat different. So, where does that leave folks that want a cycling-specific eVent jacket made in North America? Ebay aside…out of luck. The next best thing I’ve been able to find is the interesting offering from Mission Workshop, the Orion. At US$395 – definitely at the top end of the price spectrum – it has some interesting features, not the least of which is a new stretch Schoeller fabric (“c_change”) that at least on paper has some amazing attributes. A removable hood and front zipped pockets (both missing from the Cyclical) also impress. Were I to do it over again, I’d start with the Orion. Next on the list would be the ~US$200 New Zealand-made Storm Trooper from Ground Effect (also made for women and called the She Shell). I’ve also been trying to get Westcomb to make two small changes to their Cruiser LT Hoody – namely adding a two-way front zip and modifying the hood to make it removable – thus transforming it into the perfect cycling jacket (it’s already got a long back and some decently bright colors). I suppose if enough people were to shoot them an email requesting same they might actually make the changes. If you haven’t ever had a chance to see any of it in person, their stuff is beautiful. I clicked on the Orion link – it says 1 extra-large left. Sounds like another Cutter scene perhaps. Also – that is really, really pricey. I also looked at the NZ storm Trooper – note there is 15% tax to be applied. IT says shipping to the US is only $7.00 – sounds impossible?! I think J & G is the place to go and the price is good. I’d like more color selection though. I am not sure what fabric their breathable rain gear is made of, but their stuff gets good reviews from what I have seen. The Orion is also available from Chari & Co in NYC. And as far as NZ GST goes, assuming you are not curently living in NZ, you shouldn’t have to pay it (it will be deducted at checkout). The Storm Trooper is very light so I wouldn’t expect shipping to be too much, although US$7 sounds a little low – perhaps they’re subsidizing the cost. Come to think of it, its not uncommon for NZ companies to offer free shipping to the USA, so maybe US$7 isn’t so low afterall. I checked back in my emails and found the one from J&G that listed the waterproof/breathable fabric they use. As of the date of the email (back in September 2009) they were using a laminate called “Assault”, manufactured by Brookwood. I like their gear and would have gone for their stuff had the arms and legs been long enough in the sizes I needed. I wish they offered a “Tall” option.